The London Business School full-time MBA is a traditional program that can be completed in 15-to-21 months, depending on the student’s choice. The first year is devoted to the core curriculum while the second has students focusing on their elective coursework. Although the standard is 21 months, LBS allows students to take fewer electives or condense their schedules to shorten the total program length to 15-18 months. The program begins with a mandatory orientation period which, together with the Leadership Module, takes a month to complete. The core curriculum, which spans the first year of the MBA program, is primarily focused on the business fundamentals of international management, finance, strategy, and entrepreneurship. Students’ progress through the core curriculum over the three terms of the first year, after which they must complete the capstone and the Global Business Experiences program. In addition to the core curriculum, students must also take elective courses – as many as 12 courses from over 70 offered. In addition to the elective courses offered at LBS, students may also cross-register for certain electives offered at University College London. Third, in addition to the core curriculum and elective coursework, students at LBS can also choose to study a language other than English. This is not required, but recommended by the school. LBS, in conjunction with King’s College London, offers a list of nine global languages students can choose. The London Business School full-time MBA class of 2019 consists of 431 students, although including all business-related graduate degrees brings this number up to about 2,000 students per year. Thirty-nine percent of the class is represented by female students, and all students join the program with an average of five years professional working experience. Ninety-one percent of the MBA class is represented by international students, representing 63 nationalities in total. The average GMAT score is 708. The average starting salary for LBS full-time MBA grads is £79,866. Roughly 94 percent of graduates earn a job offer within three months of graduation, with the vast majority entering the consulting industry, at 41 percent. About 26 percent of graduates join the finance industry and 20 percent join the tech industry. McKinsey and Co. employed more LBS full-time MBA grads than any other company, with 37, according to the latest employment report from the business school. BCG and Bain and Co. followed closely with 36 and 35 LBS full-time MBA graduate employees, respectively. Regardless of the student’s decision to condense their program or not, tuition for the London Business School full-time MBA is £78,500, which covers core and elective course materials as well as tuition, and all accommodation for the Global Business Experience. Applicants to LBS can also pursue various scholarship options, most of which are given based on the application, but others require additional materials to be submitted for consideration. There are scholarships that are available to all applicants, as well as scholarships that are specific to women or students who are of a particular nationality or come from a certain sector of business. Beyond these scholarships, LBS has relationships with several banks to provide loans for students. 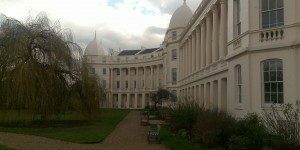 Applicants should have an undergraduate degree, though LBS considers applicants who have worked in a position of high responsibility without such a degree. Although two years of work experience is the standard, admission to this program may be granted to candidates with less than this if they can demonstrate superior academic credentials and truly outstanding evidence of leadership through professional and personal experiences. In addition to the online application, applicants must submit a one-page CV/résumé; two letters of recommendation; transcripts from all colleges, universities, and professional schools attended; standardized test scores (GMAT and TOEFL/IELTS, if applicable); and responses to each of the essay questions, which can be found online. LBS considers a 600 score on the GMAT as a minimum in order to be eligible for the full-time MBA program. Along with all of the above materials, applicants must also submit an application fee of £200. Active military candidates are exempt from paying the application fee.